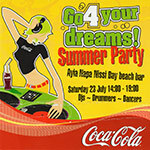 Coca Cola and Nissi Bay Beach Bar present a special event, summer party. Surprises, competitions fun & games is the name of the game! DJs, Drummers & Dancers will provide a spectacular show for you. Come and enjoy an experience you’ll never forget. Nescafe Freddo, along with Nike, Durex, Calvin Clein, Elite Gym, Mix FM and Nissi Bay Beach Bar present a special event, summer party. 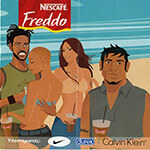 Surprises, competitions fun & games and lots of Nescafe Freddo will be available! An event that can’t be missed! Rise Club and Nissi Bay Beach Bar present Trevor Nelson – the world famous DJ and producer. 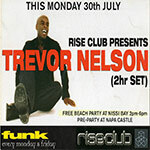 This is a special event-opening, of Trevor Nelson’s unprecedented 2 hour set at Rise Club. Join and get in the groove of the ultimate summer party day! An everyday, all day event for your enjoyment! 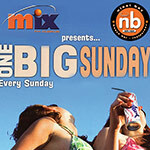 Nissi Bay Beach Bar hosts the most exclusive Daytime Beach Party event on the island! An unforgettable experience that will definitely supercharge your vacations! Experience partying like never before & enjoy a care free day under the sun! Join the wildest day time party on the island! Get here, have an unforgettable time and let Nissi Bay Beach Bar take care of all the rest for you! This is a special, exclusive event co-hosted by Castle Club. 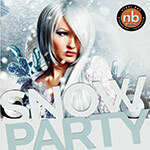 Unique by its nature, Nissi Bay Beach Bar’s snow party is an event that shouldn’t be missed. Join and be a part of the multitudes of people who have experienced it. You’ll have a lot to boast about later! Get on location to the coolest beach party on the island. Your only Sunday destination. Listen to the hits played and broadcasted live, island wide, by Mix FM – the islands’ number 1 hit music station. Featured exclusively at the event are Games, Competitions & Surprises. 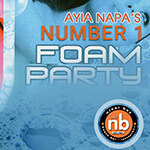 The event includes foam parties as well!